Test with "testthat" Instead of writing a list of more or less informal test, we are going to use the functions provide by "testthat". In the directory of the package, create a folder "tests". 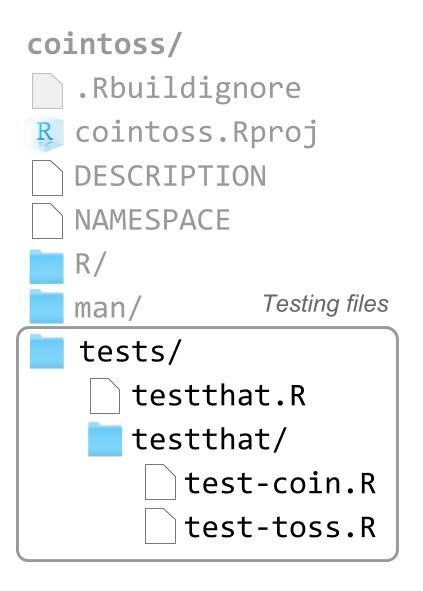 Inside the folder tests/ create another folder "testthat"; this is where you include R scripts containing the unit tests. All the script files inside testthat/ should start with tha name test e.g. test-coin.R, test-toss.R, etc. As you can tell, you simply load the package testthat, then load your package, and finally run test_check() on your package. "testthat" is one of the packages in R that helps you write tests for your functions. One of the main references is the paper testthat: Get Started with Testing by Hadley Wickham (see link below). This paper clearly describes the philosophy and workflow of "testthat". But keep in mind that since the introduction of the package, many more functions haven been added to it. 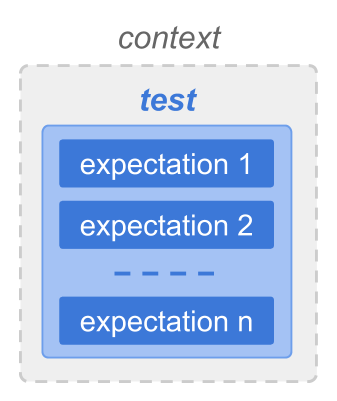 Each testing file should contain a single context() call that provides a brief description of its contents. You can organize your tests any way that you like. But again, the two extremes are clearly bad (all tests in one file, one file per test). You need to find a happy medium that works for you. A good starting place is to have one file of tests for each complicated function. To know more about testing a package with "testthat", see r-pkgs: Testing.